I've been wanting to do this for an amazingly LOOOONG time. I've even started reading up on some tutorials on how to do the things I want but... I just don't have the time to really delve into it. So I'm hoping there is someone already skillful enough to help me out. If I'd be able to control all that, that would be insanely awesome. I never understood why they didn't make it like this in the first place... Maybe because they needed a general Army painter to work with all races. IMPORTANT NOTICE: this cutomizable army should be playable in all online Steam Soulstorm games! Is there somebody with the knowledge that would be willing to work with me on this? Please? PLEASE PLEASE, PRETTY PLEASE??? I've been on all the mod boards, trying to get into touch with people but those places seem extinct of life... All succumbed to the warp?? If I'm reading you right, this is a request for Soulstorm, and not DoW III? Paint colours are defined by by a team-colourable texture file (in vDoW and its expansions) that would require you to edit all of the textures for the SM infantry in order to do this. It's not impossible, but it's a lot of work and by default is a modification - which means it will only work online for other players with the same modification. You could try setting it up as something that overwrites your default DoW content only, this might make it work online, but it would only be visible to you, and everyone else would see the default Space Marine models. PS - that last image link of yours seems broken, but it might be because I'm at work. Awesome for you to get back to me. Yeah, thought it would be even more difficult. I wouldn't mind being the only one seeing it. But I'd need guarantee it would work online and it may be too much trouble for what it would be worth. But how about the small 5 color change? Would you know anybody who could and would be willing to help me with that? It's just too much for me now to go through all the documentation and guides. I'd really like to get at least this working for me in online games. I could do so much with these changes already. Pls, get back to me if you know anybody to help me with this request or maybe... you could find it in your heart to help me yourself?? There aren't any active DoW modders here @Valiant, I can provide guides and tools if you need them, but if you don't have the time either then they might not be much help. It's a lot of texture work. 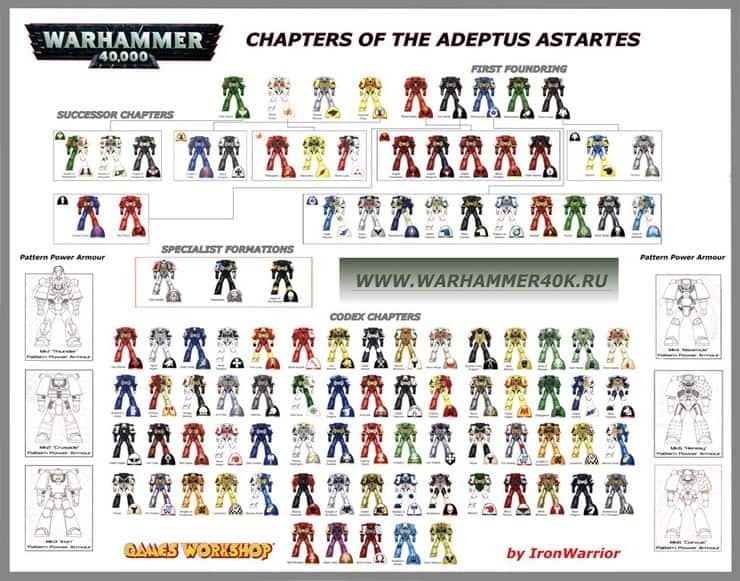 Your original five-colour suggestion doesn't match what the paintable areas on the texture allow in the first Dawn of War game(s), so again, it would be texture work to change that. @Gorb Ok, I understand now. If it wouldn't be too much trouble and if the guides and tools are easy to understand if effort is put in, I'd love for you to send me them. These areas are paintable areas in the in the Army Painter, no? ?